One of Peru’s digital investigative journalism sites and its largest radio broadcasting company have teamed up to verify public discourse and share their findings across the country. 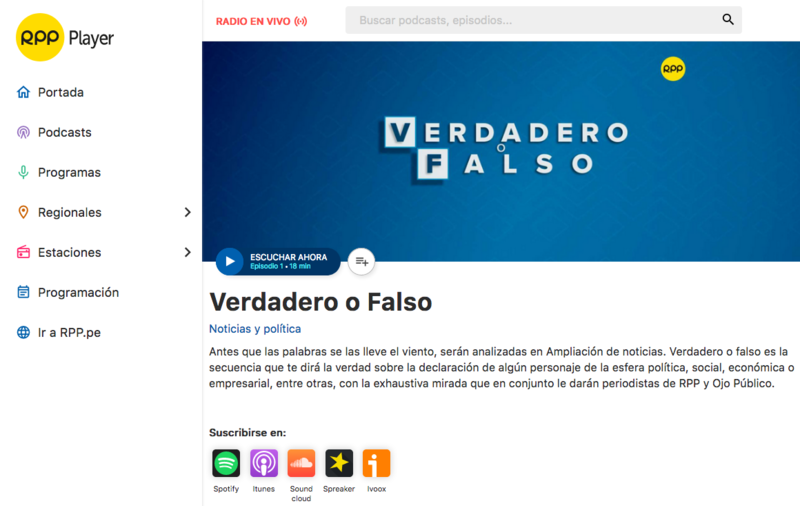 Ojo Público and Radio Programas del Perú (RPP) launched the 10-minute segment “Verdadero o Falso” (True or False) on Nov. 1 and turned their eyes and ears to public figures in a country besieged by political corruption scandals. "In recent months we approached Radio Programas to try to see if we could work on some things together. (...) Among all the possible collaborations with RPP, we started with this space 'Verdadero o Falso,’ to publish fact-checking content," David Hidalgo, founder and editor of Ojo Público, told the Knight Center. Ojo Público already had a space on its site for verifying public discourse called Ojo Biónico. However, at the initiative of both media, they decided to work together to bring the verification of discourse to the whole country in order to reach a larger audience. Regarding the verification of public discourse, Daniel Titinger, RPP's journalistic director, told the Knight Center that it is a great exercise of precision and responsibility in a national and global context in which arguments usually come with half-truths and without data that supports those affirmations. The segment, which will last from 10 to 12 minutes, will be broadcast every Thursday in the popular news program Ampliación de Noticias, between 9 and 10 A.M. The objective is to verify three phrases of the week that have been said by politicians, public figures, etc., that have been widely disseminated in social networks or traditional or digital media and that have gained public relevance. The phrases to be verified will have audio or video support as proof to the audience that they were said. "One of the things we want to make clear is that there is no doubt that what was said, was said. We have put that requirement, that there is audio or video," said journalist Diego Salazar, a collaborator from Ojo Público who will be in charge of the fact-checking and the writing of the text for the segment that also will be published on the sites of both media outlets. "The first piece of criteria for us is relevance, that there’s relevance that’s informative. It is not our interest to go hunting, nor to catch the politician red-handed, but simply (to verify) something that is relevant and could be interesting to the audience," he said. According to Salazar, they also won’t verify opinions or feelings, but statements that are affirmative, based on data, figures or precise information. In the first installment, which aired on Nov. 1, the program classified as false a statement from politician and congressman Mauricio Mulder who said that investors were no longer investing in Peru due to the political environment. The second phrase of that week was an imprecise statement from a beauty contestant concerning the early detection of breast cancer and the lack of sufficient mammography equipment in Lima. And the third one was to corroborate if, in fact, the Peruvian procession of the Lord of Miracles, also called the purple Christ, is the largest and most attended in the world, which was said by one of the representatives of the Brotherhood of the Lord of the Miracles. 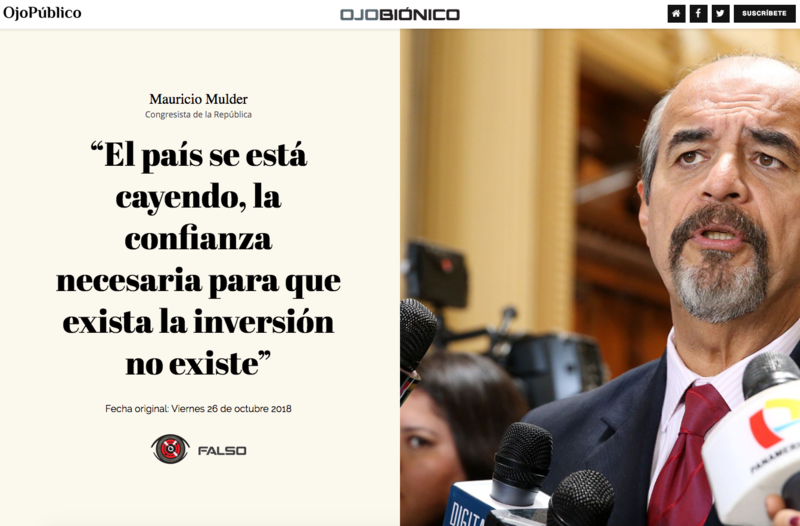 "Our agreement is to work in terms of an alliance, and that supposes that, for example, we publish the same content (of the fact-checking of the phrases) simultaneously on the Ojo Público website and on the RPP website, so that the scope of communications increases and then that makes it quite interesting," Hidalgo said. This written publication is posted at the end of the broadcast of the radio segment. Fujimori is founder and director of the party Fuerza Popular (Popular Force), the main opposition party that has a majority in Congress. She has been a member of congress and a two-time candidate for the presidency; is daughter of former president Alberto Fujimori (1990-2000), who led an authoritarian government and was tried for corruption and crimes against humanity. Was it a good day to launch, if the whole country seemed to be closely following the aftermath of the preventive prison sentencing?, Titinger wondered. "We assumed that any day would be [good] and we were not wrong. The response was immediate," said the journalist, commenting that the new program segment on RPP became a trend on Twitter and two of the people whose statements were submitted for verification called the station to supplement their arguments.